Oatmeal Upgrade: Think of oatmeal as a stodgy old fashioned stalwart? Think again with this easy breakfast that really wows. In a skillet over moderate heat add coconut, brown sugar and Meyer lemon juice and stir until sugar is dissolved. Add berries and cook, until juices release making a sauce, 2 to 3 minutes. Sprinkle with cinnamon. Remove from heat and let cool. Combine yogurt, cream and vanilla and stir. Set aside. Preheat oven to 350ºF (180ºC). Line a rimmed baking sheet with parchment paper. In a large bowl, combine oats, almonds, coconut, and brown sugar. In a saucepan over low heat, combine the agave and oil stirring, until hot. Pour the mixture over the oat mixture and stir to coat evenly. Spread the mixture on the prepared sheet. Bake, stirring occasionally, until the granola is golden brown, about 30 minutes. Place ¼ cup (60ml) yogurt in the bottom of each glass. 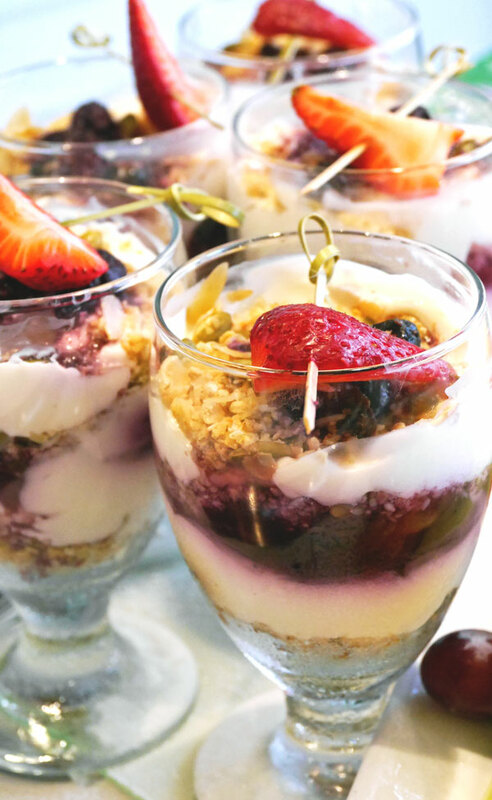 Add 2 tablespoons (30 ml) of the berry compote over the yogurt and then repeat with another layer of yogurt, about 1 tablespoon (15 ml) sprinkle with granola crumble to taste. Garnish with berries and serve. Kitchen Helper: Which type of oats should I choose? Keep in mind that after oats are harvested, they are separated from their hulls and stalks. The resulting grain kernel is called an oat groat. Choosing the right kind of oat for you depends on flavour, cooking time and availability. We’ve highlighted the three most widely available types. 1 Steel cut oats/Irish Oats are made from sliced oat groats. They have a chewy texture and cook in 20-40 minutes. Great for a hearty breakfast, risotto or stew. 2 Rolled/old fashioned Oats are made from steamed, flattened and dried oats groats. They cook in 10-15 minutes and have a nutty flavor. Great in baking. 3 Quick Oats are made similar to rolled oats but the flakes are thinner and they are steamed longer. They cook in about 5 minutes and have less texture. Great for a quick breakfast. This original recipe first appeared in the Spring 2014 issue of City Style and Living Magazine.